Main.axml –アプリケーションの既定のユーザー インターフェイスのレイアウト ファイルです。Main.axml – The default user interface layout file for an application. Android 間を使用して、 .xmlファイルの拡張機能は、Xamarin.Android で使用して、 .axmlファイル拡張子。Note that while Android uses the .xml file extension, Xamarin.Android uses the .axml file extension. 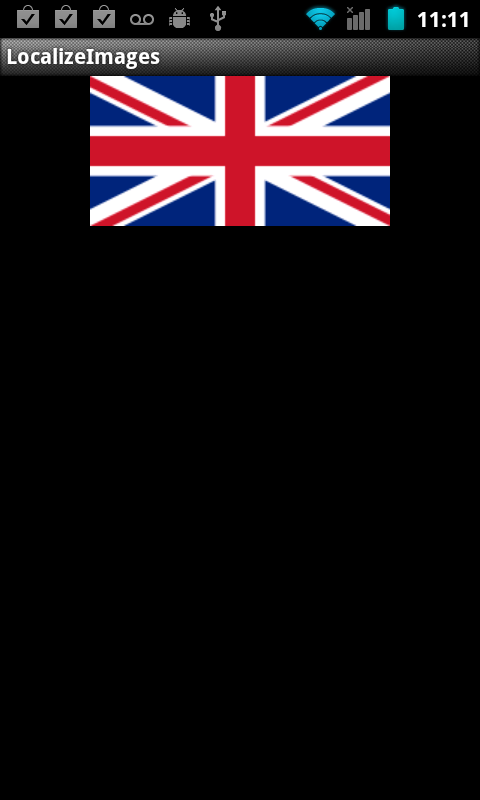 AboutResources.txt –これは必要ありませんし、安全に削除された可能性があります。AboutResources.txt – This is not necessary and may safely be deleted. だけのリソース フォルダーとファイルが、高レベルな概要を提供します。It just provides a high level overview of the Resources folder and the files in it. 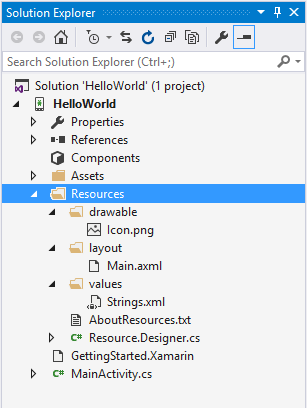 Resource.designer.cs –このファイルが自動的に生成され、Xamarin.Android と一意の保留によって管理される ID の各リソースに割り当てられます。Resource.designer.cs – This file is automatically generated and maintained by Xamarin.Android and holds the unique ID's assigned to each resource. これは非常に似ています、Java で記述された Android アプリケーションを持つ R.java ファイルと同じ目的です。This is very similar and identical in purpose to the R.java file that an Android application written in Java would have. Xamarin.Android ツールによって自動的に作成し、時間の経過に再生成されます。It is automatically created by the Xamarin.Android tools and will be regenerated from time to time. 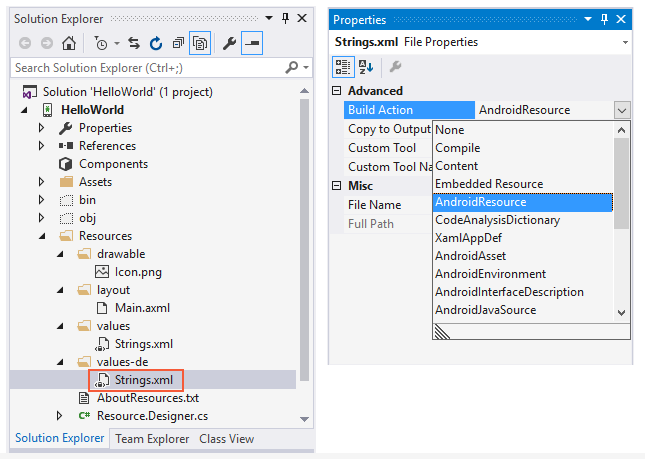 これにより、Xamarin.Android ツールを適切にコンパイルし、APK ファイルへのリソースを埋め込みます。This allows the Xamarin.Android tools to properly compile and embed the resources in to the APK file. 何らかの理由の場合、ビルド アクションに設定されていないAndroid リソースはファイル、APK から除外し、読み込みまたはリソースにアクセスしようとすると、実行時エラーになり、アプリケーションがクラッシュします。If for some reason the Build Action is not set to Android Resource, then the files will be excluded from the APK, and any attempt to load or access the resources will result in a run-time error and the application will crash. または Android には、リソース アイテムのファイル名が小文字のみがサポートされます、Xamarin.Android では少し寛容; に注意してください。これは、大文字と小文字の両方のファイル名をサポートします。Also, it's important to note that while Android only supports lowercase filenames for resource items, Xamarin.Android is a bit more forgiving; it will support both uppercase and lowercase filenames. イメージ名の規則は、区切り記号としてアンダー スコアと小文字を使用する (たとえば、マイ_イメージ_name.png)。The convention for image names is to use lowercase with underscores as separators (for example, my_image_name.png). ダッシュやスペースを区切り記号として使用する場合にリソース名を処理できないことに注意してください。Note that resource names cannot be processed if dashes or spaces are used as separators. アプリケーションで使用する 2 つの方法があるリソースがプロジェクトに追加されたら、–プログラムで (コード) 内や、XML ファイル。Once resources have been added to a project, there are two ways to use them in an application – programmatically (inside code) or from XML files. それぞれのリソース ID は、リソースの種類に対応する入れ子になったクラス内に含まれています。Each resource ID is contained inside a nested class that corresponds to the resource type. たとえば、ファイルIcon.png Xamarin.Android の更新をプロジェクトに追加された、Resourceという入れ子になったクラスを作成するクラス、Drawable定数内で名前付きIconします。For example, when the file Icon.png was added to the project, Xamarin.Android updated the Resource class, creating a nested class called Drawable with a constant inside named Icon. 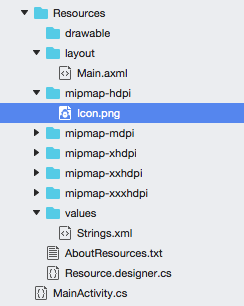 これにより、ファイルIcon.pngとしてコードで参照されるResource.Drawable.Iconします。This allows the file Icon.png to be referred to in code as Resource.Drawable.Icon. 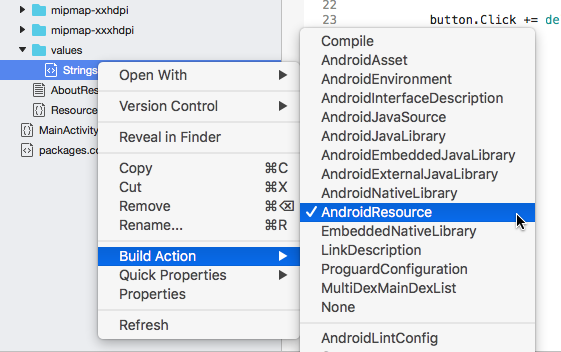 Resourceクラス手動で編集しないでとに加えた変更は、Xamarin.Android によって上書きされます。The Resource class should not be manually edited, as any changes that are made to it will be overwritten by Xamarin.Android. PackageName –リソースを提供する、のみ、パッケージが必要なときに使用されている他のパッケージからのリソース。PackageName – The package which is providing the resource and is only required when resources from other packages are being used. ResourceType –上記で説明したリソース クラス内にある入れ子になったリソースの種類します。ResourceType – This is the nested resource type that is within the Resource class described above. リソース名 – (拡張子なし)、リソースのファイル名または XML 要素に含まれるリソースの android: name 属性の値になります。Resource Name – this is the filename of the resource (without the extension) or the value of the android:name attribute for resources that are in an XML element. ResourceType –リソース クラス内にある入れ子になったリソースの種類します。ResourceType – This is the nested resource type that is within the Resource class. リソース名–これは、リソースのファイル名 (せずファイルの種類の拡張機能) の値は、 android:name XML 要素に含まれるリソースの属性。Resource Name – this is the filename of the resource (without the file type extension) or the value of the android:name attribute for resources that are in an XML element.